I Am Images & Music. I love using my skills as an illustrator, 3d-artist and music composer to create audiovisual experiences to tell stories or to visualise concepts, that may become real in the future. 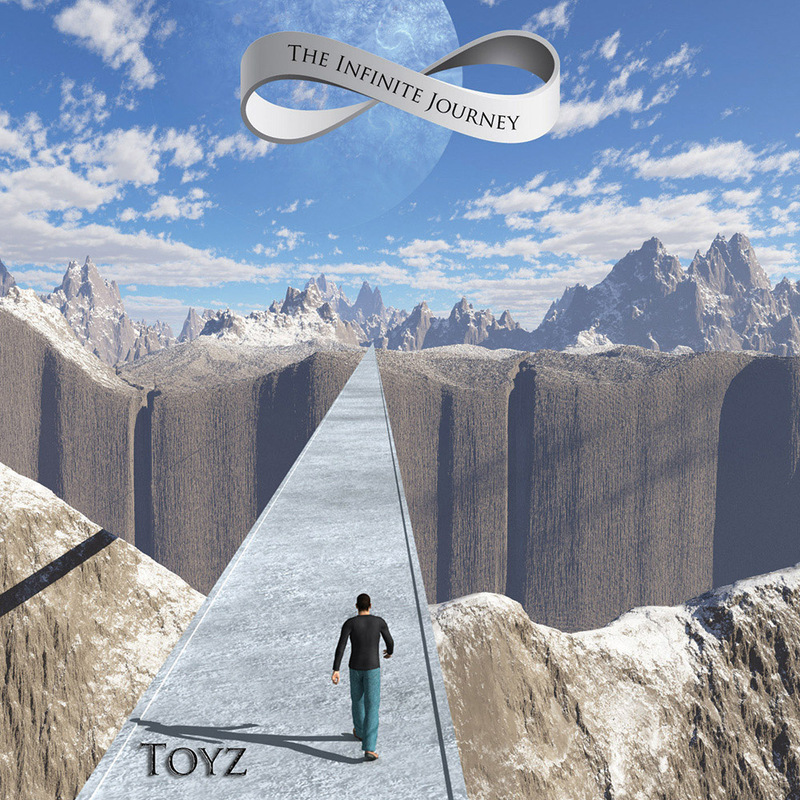 In this way I hope to contribute to creating a better world and to inspire others, like I was inspired by futurists, SF writers, SF painters and movie makers. My roots lie in illustration and graphic design, but also in science fiction and airbrush painting. Always striving for photorealism when visualising ideas and stories. to be able to visualise ideas and concepts evermore realistically. Just moods, or entire stories, anything can be designed and tailored to your needs. The ultimate method of communication: moving images combined with music and sound design to create the best carrier for your story, your ideas, your message. I create beautiful images and sounds to help you tell your story. Triview technical communication is a company that specialises in effectively publishing and maintaining technical information, such as user manuals, maintenance manuals, installation manuals, but also training material (e.g. : e-learning). For their 2017 Christmas seasonal greetings they came up with the idea of not sending a single image Christmas card, but to create an 8 page pdf, in which a Christmas turkey recipe was presented in a technical user manual approach. 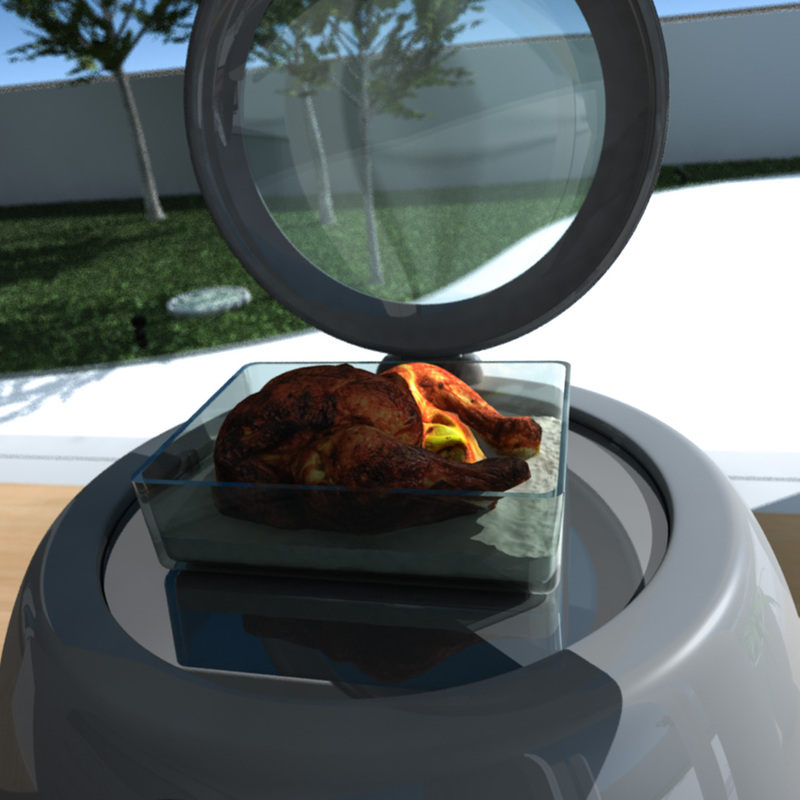 To enhance the technical aspect of cooking a turkey, they wanted to include user instructions for an oven. Furthermore the basic idea behind the pdf was to showcase the more modern approach to technical publication, where 3d-cad models are extensively used for creating illustrations or animations to clarify process steps. That's where I came in. 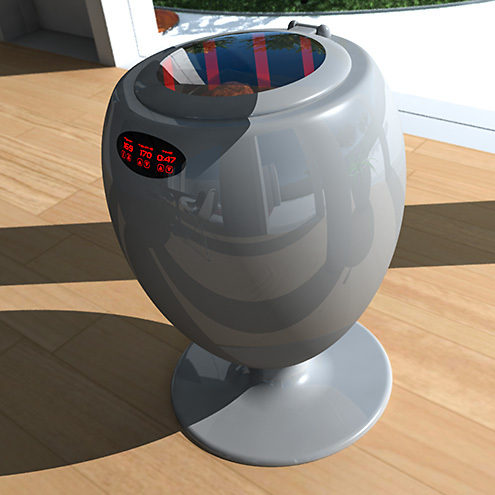 Searching the internet for inspirational images together with Marc van Mourik (who had conceived the idea), we chanced upon images of the "KaionWAVE", which was not an oven, but a washing machine concept, entered by Wang Sin Ee in a design competition organised by Electrolux in 2005. 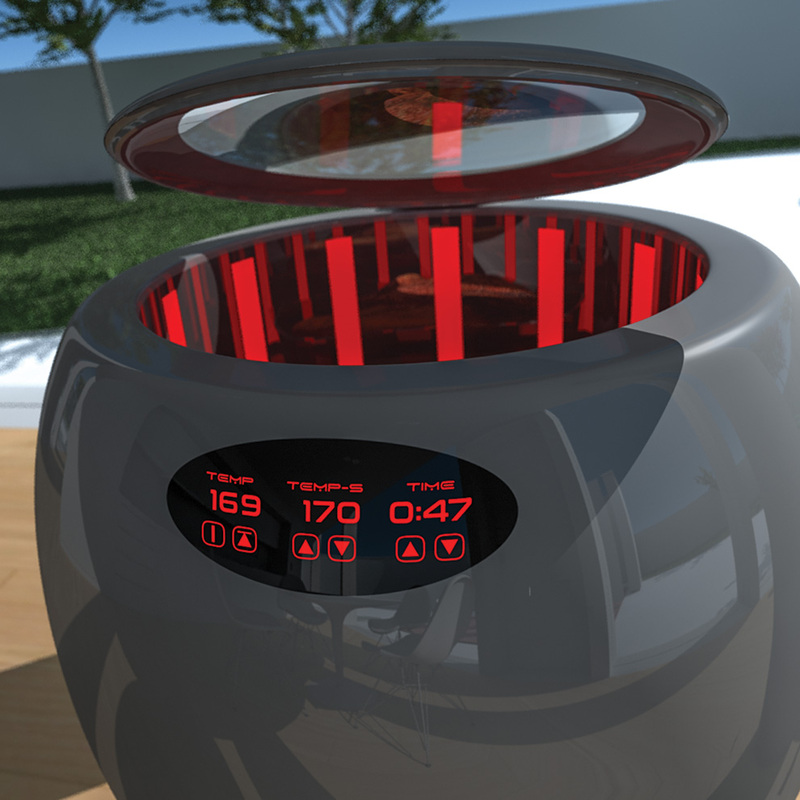 Both of us immediately saw the possibility of using such a design for a futuristic concept of a freestanding oven. 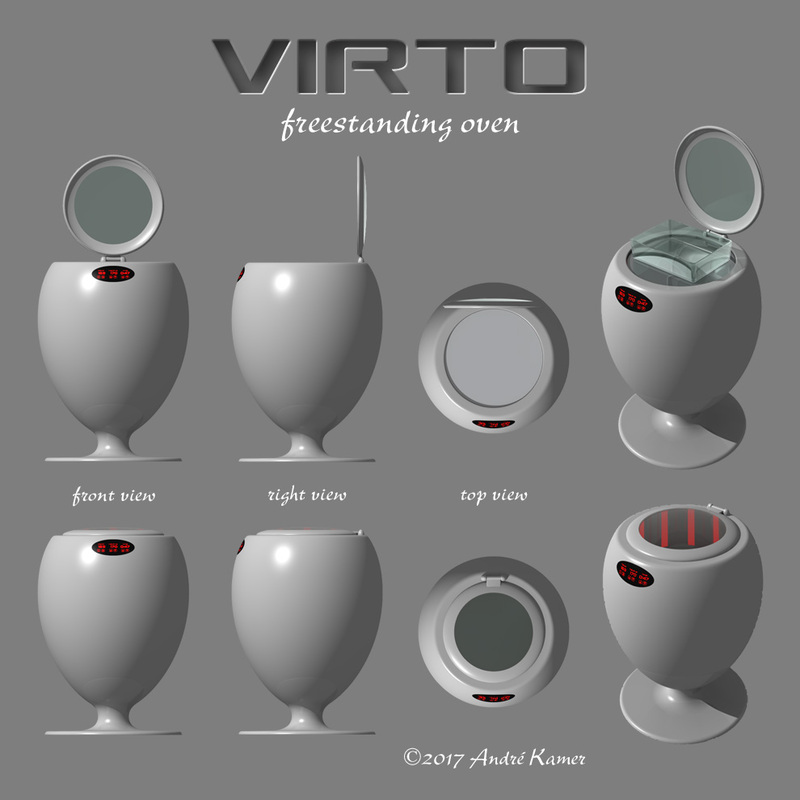 I modeled the VIRTO (Virtual Infra Red Triview Oven) in Lightwave and created an animation and some images, which were then used in the Christmas pdf. 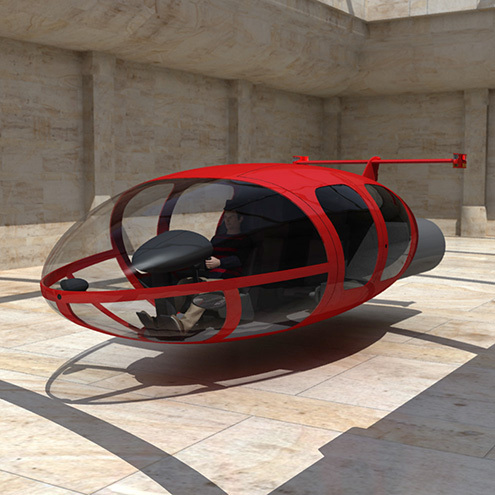 I have always been fascinated with future design and with Science Fiction. 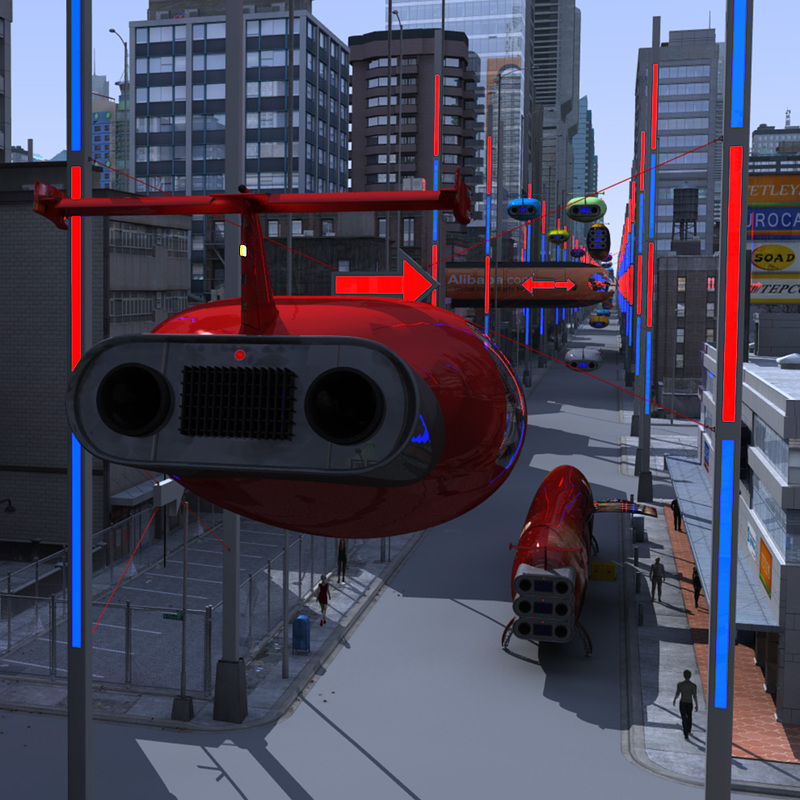 I was inspired by futurist Syd Mead, but also by SF artists like Peter Elson, Tony Roberts and Chris Moore. Other major inspirations were movies like Bladerunner and the Star Wars series: I like it best when a complete world is created, not just a single object. Therefore, when I'm designing something for the future, I will also think of the environment in which it will be used. 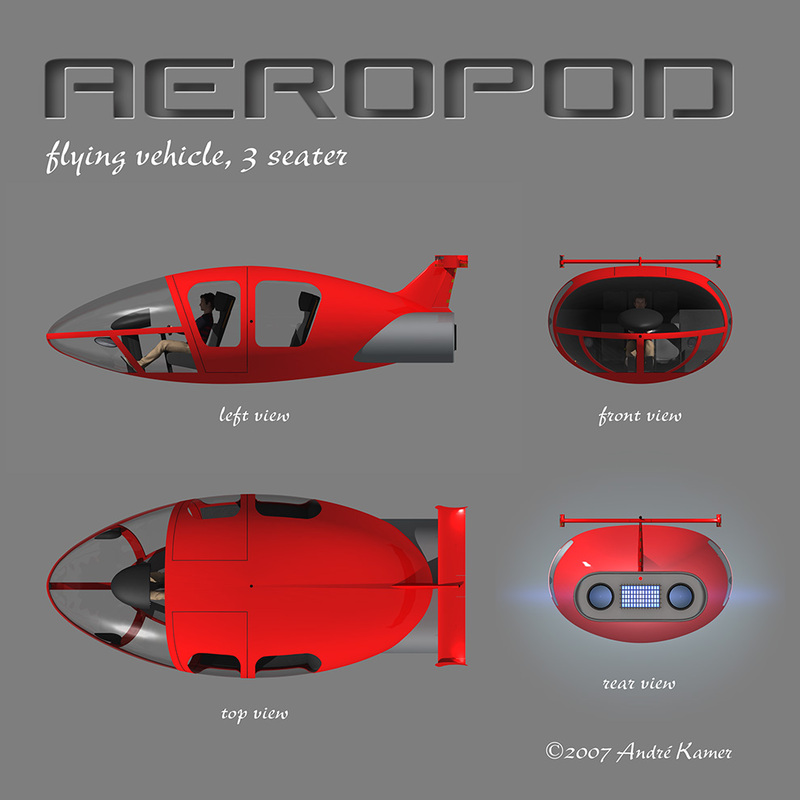 With this design for a flying vehicle, called the Aeropod, I didn't want to create another car with the wheels covered over. 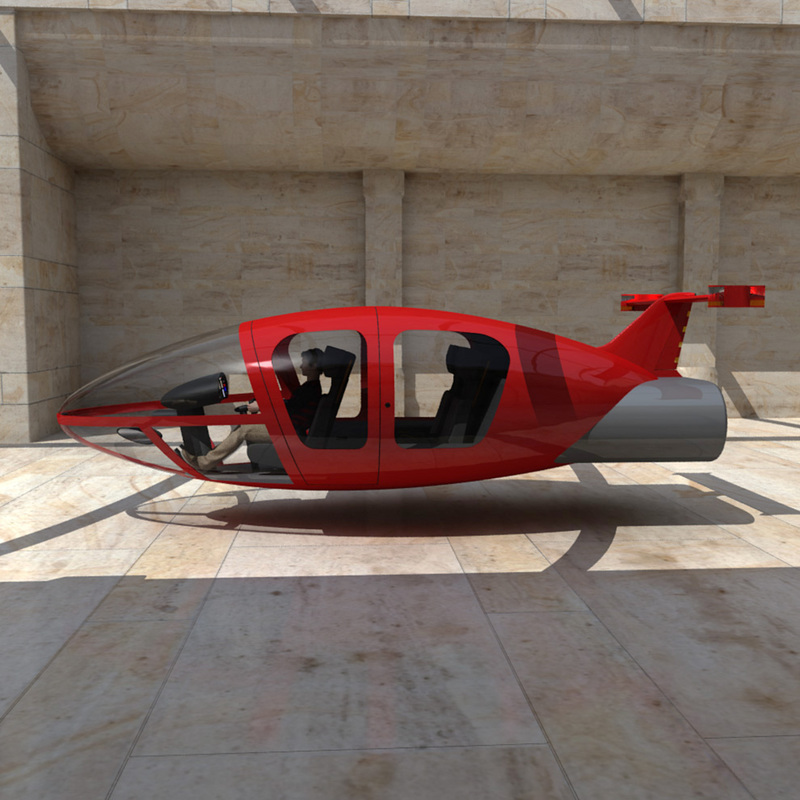 This design was primarily shaped by aerodynamics and usability and so it has more in common with a helicopter than with a car. 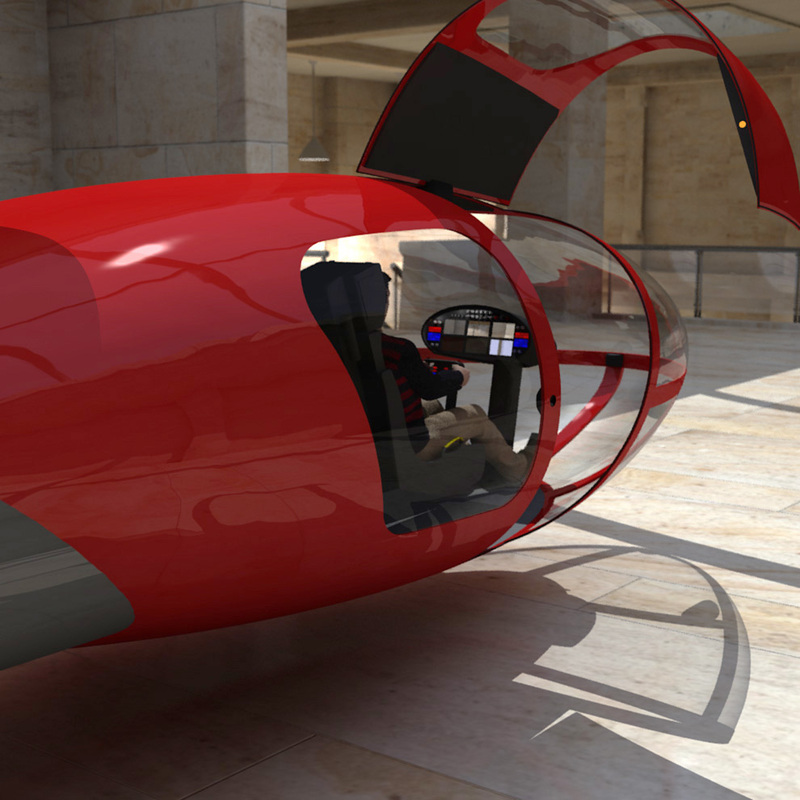 With many flying car designs, accompanying texts talk about ultimate freedom and escaping the traffic jams. 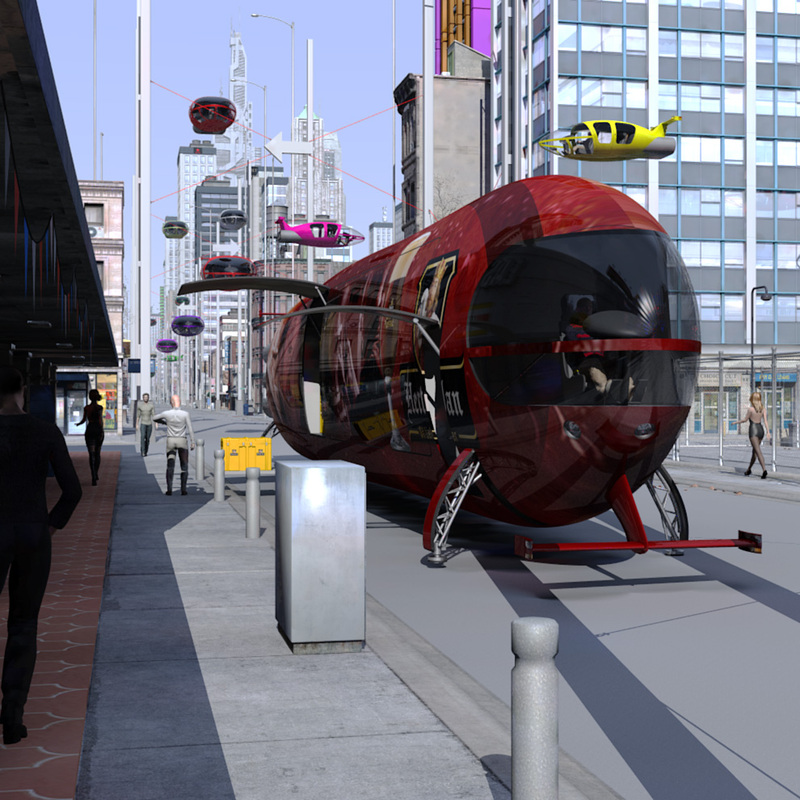 That of course is a folly: it would only work if there are just a handful of flying vehicles. 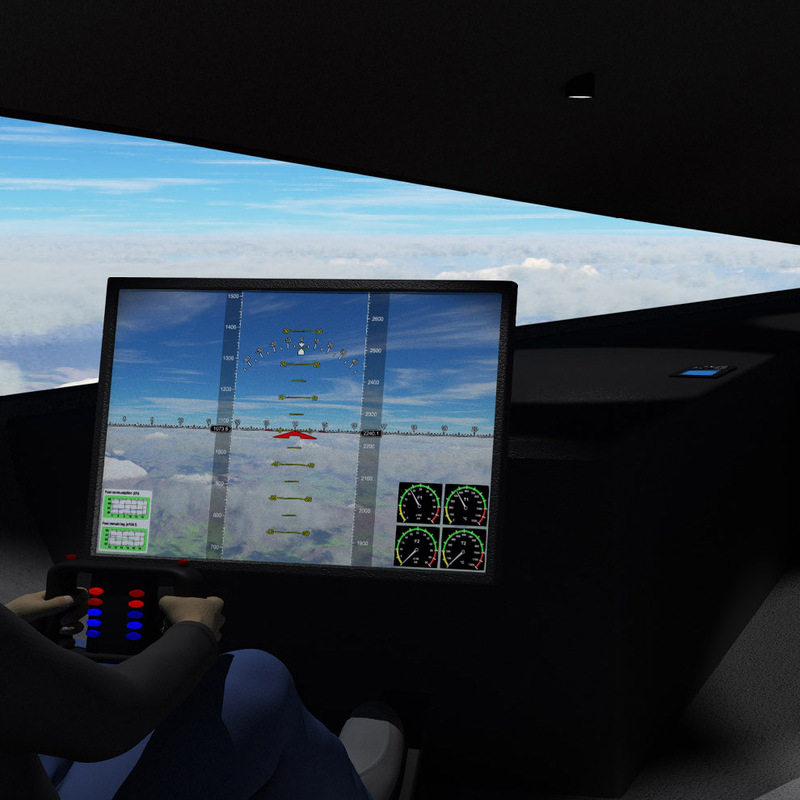 However, when everybody owns one, there would be chaos in the skies (mid-air collisions would be fatal). So, you would still need some sort of traffic regulation. 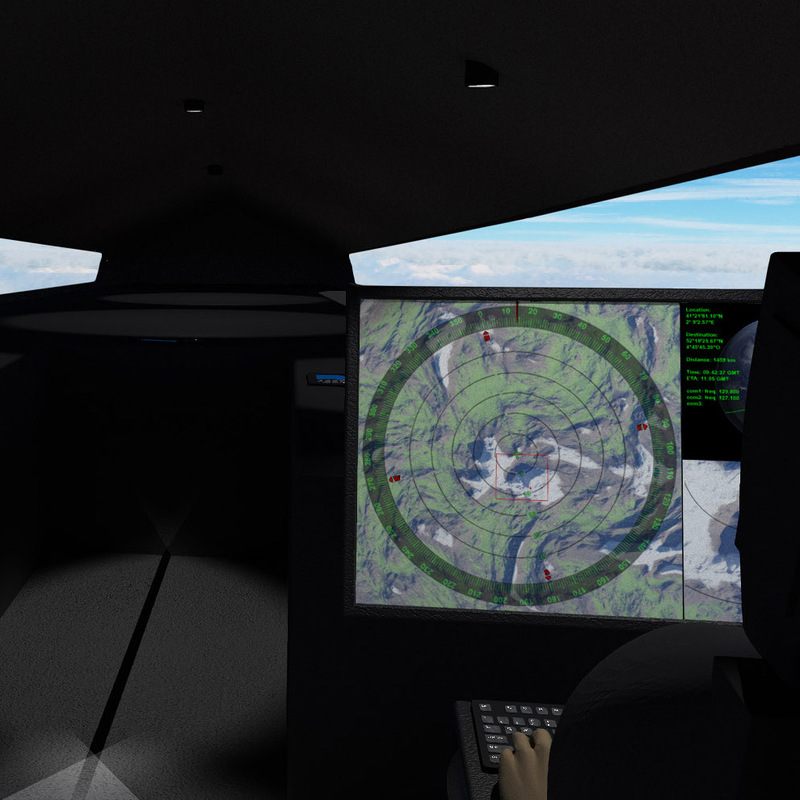 The best solution would probably be to hand over the controls to advanced computers and let them sort it all out. But people are somewhat reluctant to fully trust computers with their lives, as computers are machines and machines inevitably will break down. 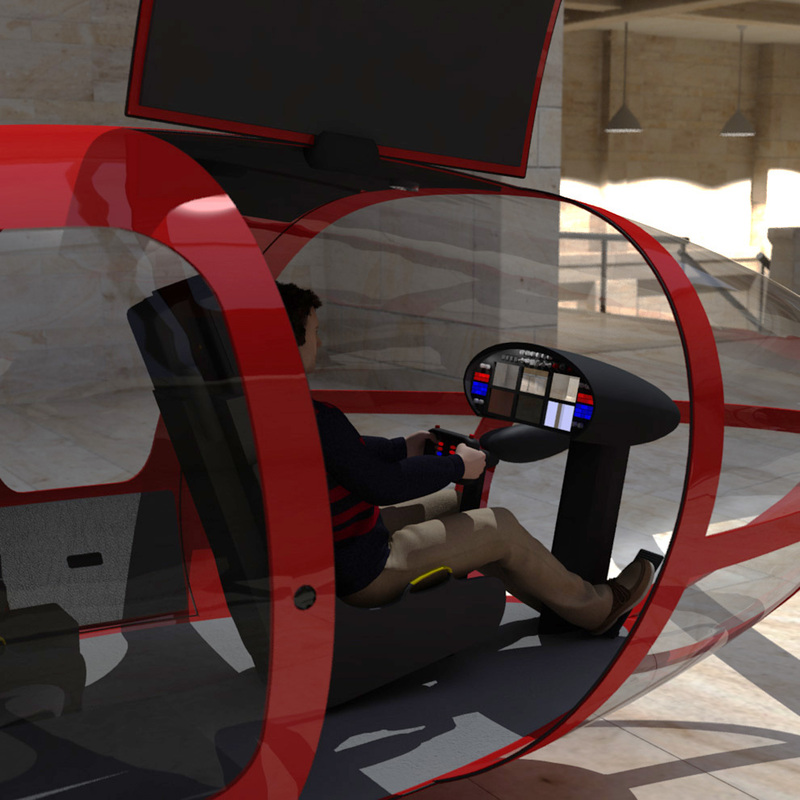 So, even in the future they'll likely still want to have their hands on the wheel. 1. the bottom layer: for stopping or parking. For all directions of traffic. 2. interchange layer for north-south traffic. For changing direction. 3. interchange layer for east-west traffic. For changing direction. 4. highspeed layer for long distance north-south traffic. 5. highspeed layer for long distance east-west traffic. The basic idea is to assign crossing traffic to separate layers, so vehicles can move on unhindered. 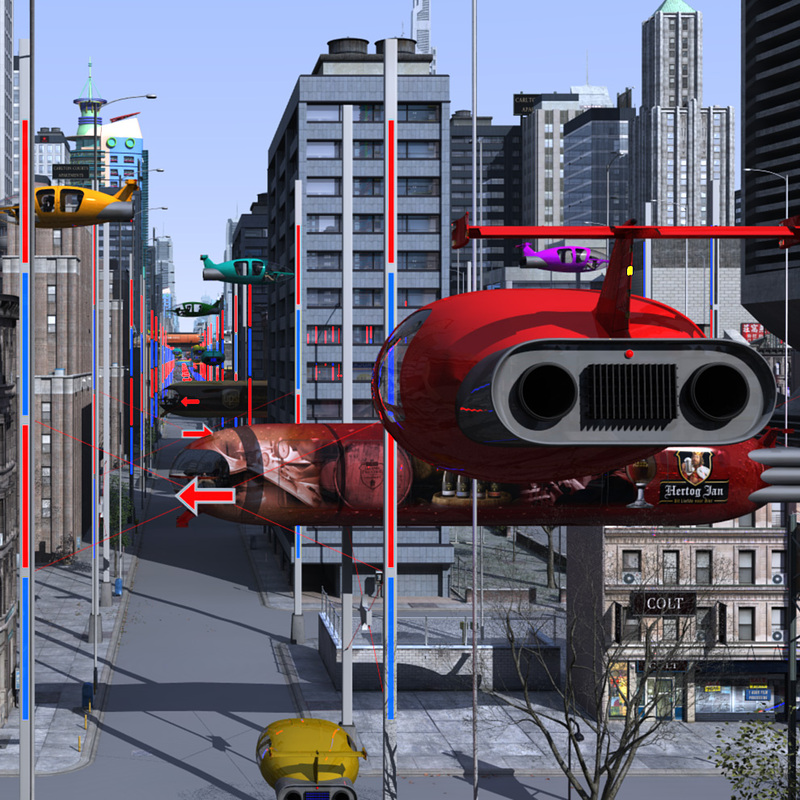 Long distance traffic can move at high speeds (in this animation up to 300 km/h) in the top two layers. 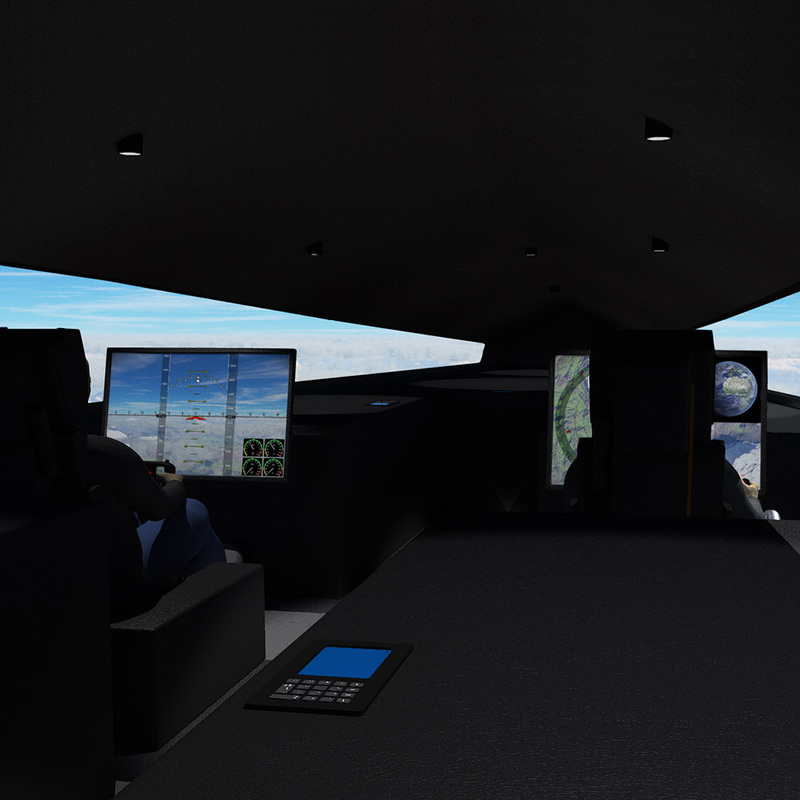 When you need to change direction, you descend to the interchange layer, where the average speed is 50 km/h. After changing direction you also switch layers. 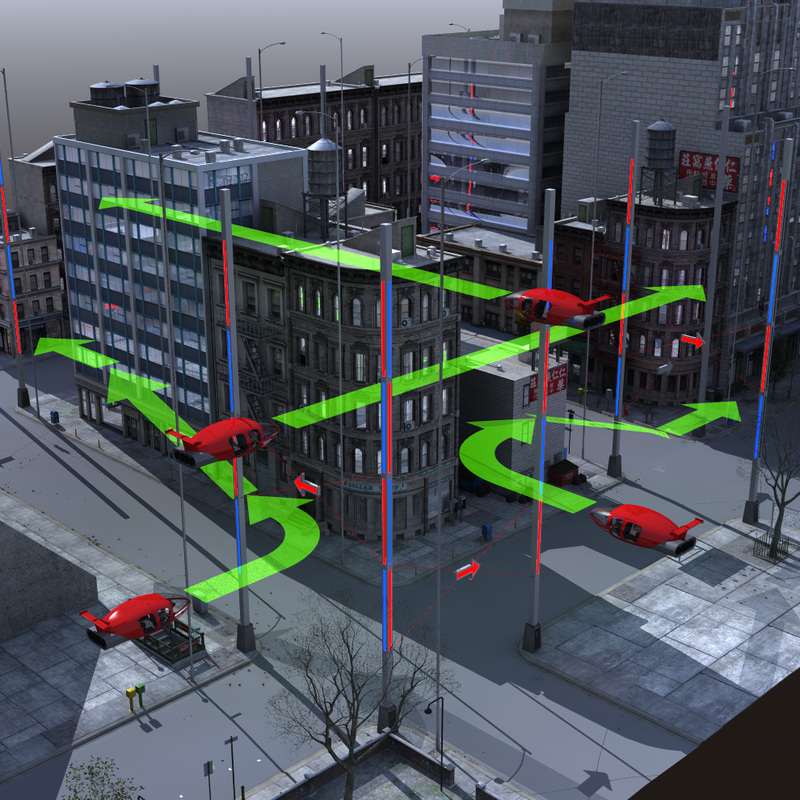 The signposts at the intersections indicate which layers are open to you (blue lights) and which layers are assigned to cross traffic (red lights). In this example streets have one-way traffic, so there also are traffic direction indicators at the interchange layers. To complete the scene, I also needed freight transporters. 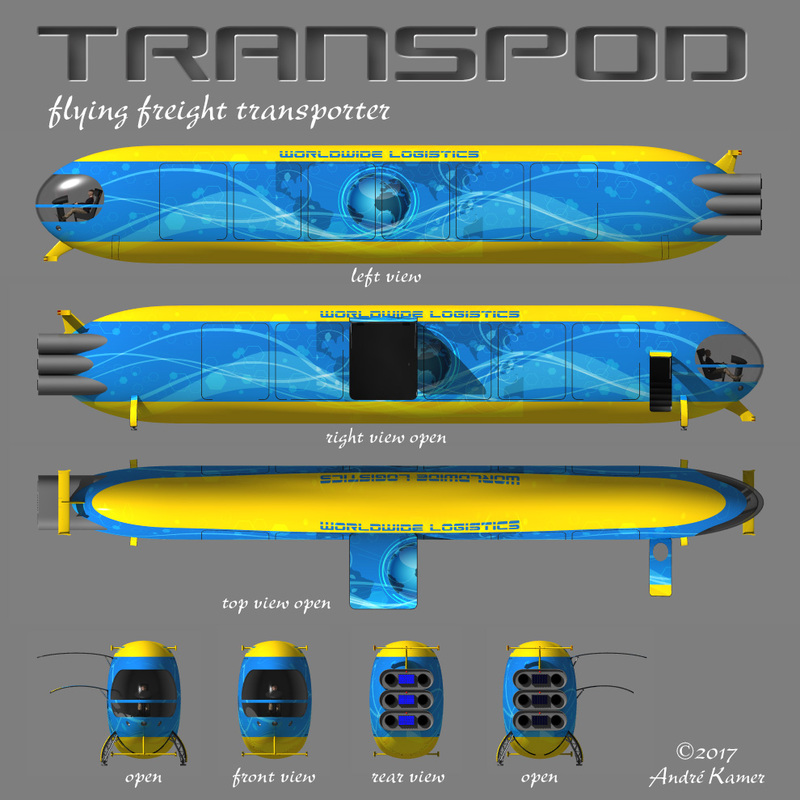 So from the Aeropod design I derived the Transpod (image nr. 10 in the slider). This animation was conceived to demonstrate the combination of skills I bring to bear to tell a story through beautiful images and sounds. The famous Discworld novelist Terry Pratchett once said: “The anthropologists got it wrong when they named our species Homo Sapiens ('wise man'). In reality, we are Pan Narrans, the storytelling chimpanzee.” That's it: we (humans) LOVE stories! The entire animation started from this single image. Even without the title it tells a story. That story will of course be different for every individual who sees it: the animation I created is just one possible storyline, but just as with turning a book into a movie: once you've seen the movie, it will replace the images that formed in your head when you read the book. The first item to be created was the cathedral. I could have modeled it from scratch, but that would have been a huge waste of time, because there was a perfectly suitable alternative availlable at Daz3D.com in the form of the "Winterblack Halls construction set". I took one of the preconstructed floorplans and addapted it to my needs. I exported it from Daz Studio to Lightwave and there I scaled up the building to 20 times its original size, while keeping the chandeliers and some other details at a human scale. I added the stained glass windows. For that I used paintings from Hieronymus Bosch (2016 was Bosch year, commemorating his passing away in 1516), depicting scenes from Heaven and Hell. With the cathedral done it was time to do some real modeling: from scratch I created an airship for my protagonists, taking inspiration from a viking longship. Then it was time to chose the actors who were going to sail my airship. I decided on the Genesis 3 Female Nathalie and on the basic Genesis 3 Male Eddie. They were posed and clothed and animated in Daz Studio and then exported to Lightwave. With all the elements in place it was time to do the animating bit. In fact, this was the most time cosuming part of the process, as it takes huge amounts of render time to create the sequence of images needed to make a movie, especially when you have volumetric lighting in your sene (the visible lightrays). Fortunately my computer could run that task unsupervised, for days and nights on end. 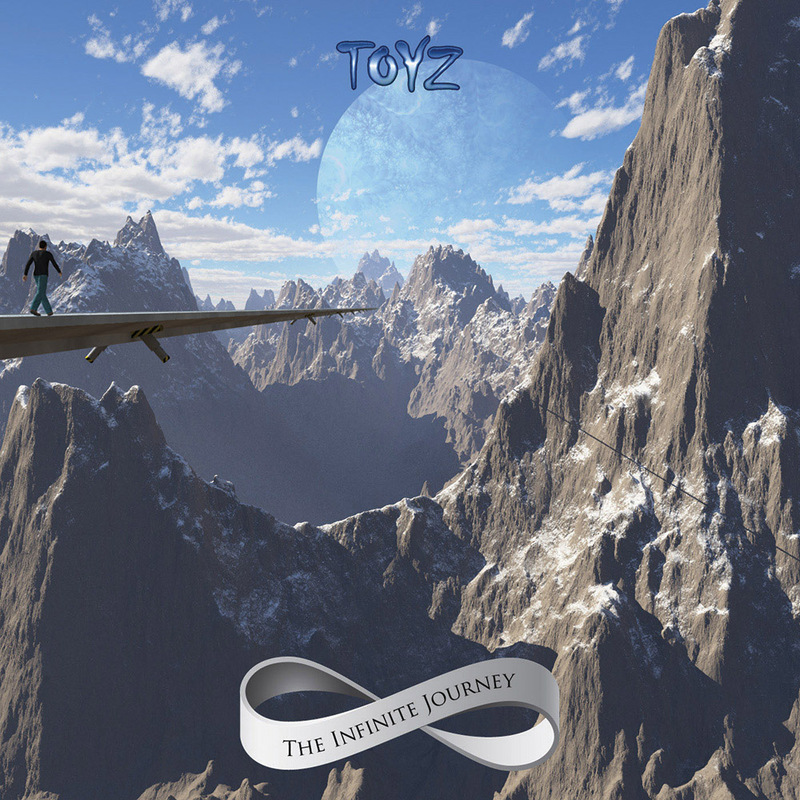 The last bit to be created was the introduction scene, to provide the mini story with a head and tail. 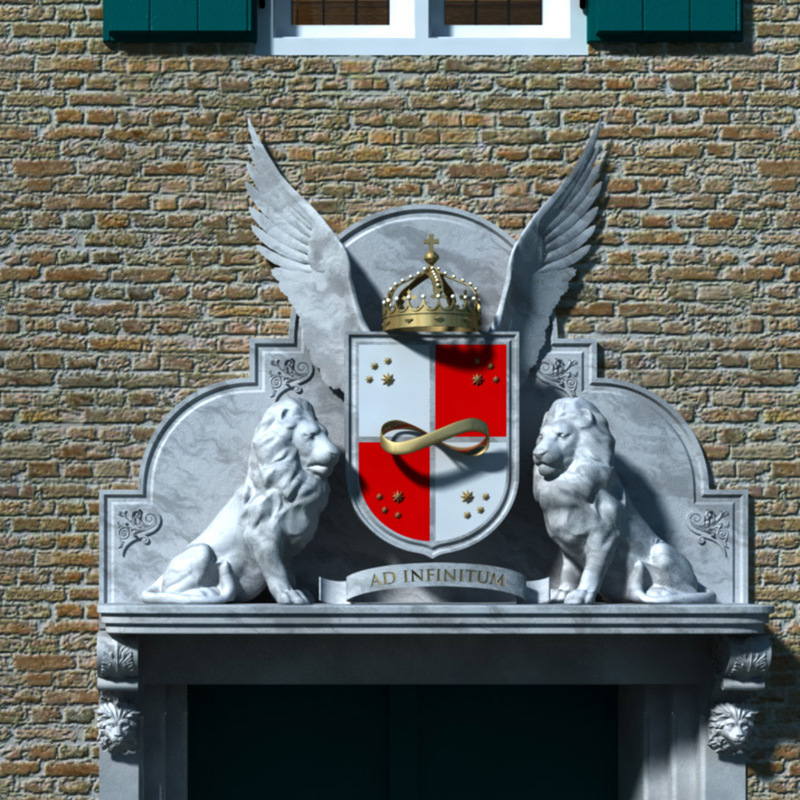 Again, I could have modeled a room from scratch, but there was a very nice one available at Daz3D.com: the "Baroque Grandeur" model, which I combined with the model "Maps of the Empire" and some minified rocks from "Rock My World - Iray Boulders". All I really needed to do was create a garden outside the (optimised) stained glass windows and a suitable map to be diplayed on the desk. Last, but not least, came the soundtrack: recording the voice over, combining that with the birds in the garden and the harpsichord playing the melody of the Gregorian chant, that backs the scene at the cathedral. The engine-noise of the airship, the water layer and the dragon growl and finally the organ bit. The finishing touches for the movie. Most of my 'exotic' holidays (Morocco, China, India, Cambodia, Japan), I've travelled with my lifelong friend Rijk-Willem, who does photography and video for a living. Time and again Rijk found, that when he took pictures on his trips, he was always a bit disappointed with the result when he got home: somehow he hadn't quite managed to capture the moments the way he hoped he had. When we were discussing this phenomenon, we came to the conclusion that it was probably due to 'focus': when you're on a professional shoot, you know what's expected of you and you're focussing on doing a good job. When you're on holiday, however, your primary goal is to relax and enjoy yourself. The 'taking pictures' bit is secundary. 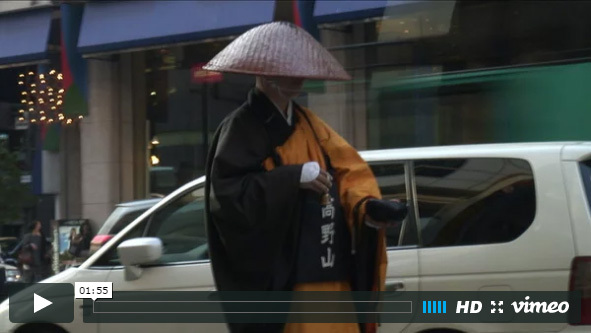 To make it work, we set ourselves goals for our trip: mine was to eventually create a documentary, that would showcase the contrast between ancient, tradition based Japan, and modern, gadget-crazy Japan. And over the two weeks of traveling I managed to shoot a number of very usable scenes. On the last day, in Tokyo, we decided to go shopping for some souvenirs. We went to the Ginza district to visit the Sony-centre there (which was great fun) and then set out to find us some souvenirs. We quickly found out we had picked the wrong area to look for souvenir shops or warehouses: the streets were lined with Gucchi and Armani and other high-brow shops. Even when we thought we had found some sort of 'Harrods', it just turned out to be another collection of Gucchi and Armani stands. When we walked out of that building, we almost bumped straight into a Buddhist beggar monk, who was inching his way along this shopping street (Chuo Dori), sounding his little bell at every step and performing a 'thanks giving' ritual everytime someone stopped to put some mony in his bowl. 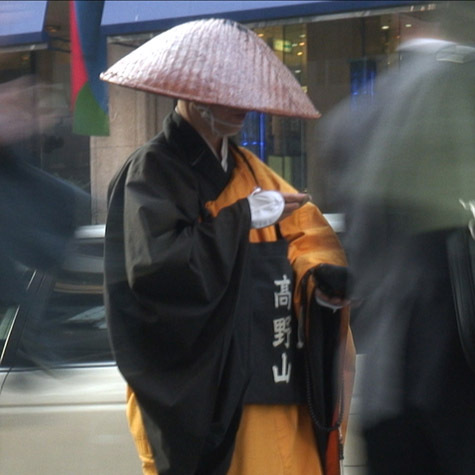 This scene epitomised my search for the contrast between ancient and modern Japan, it was simply irresistable. At the spot I chose to enhance the contrast between the slowly walking monk and the shoppers rushing by, by using a very slow shutter speed: this would render the monk sharp (as long as I could keep him steady in the centre of the image) and would reduce the shoppers to semi-transparent phantoms. 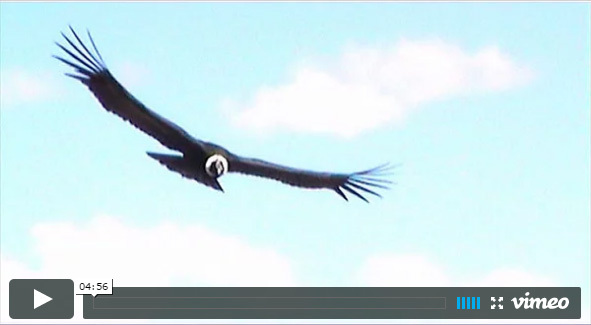 By this amazing bit of good fortune, I was able to shoot this piece of footage, that symbolises exactly what I had been aiming to capture all along! The first time I saw a picture of the Taj Mahal was when I was about ten years old. Many years later I took up studying architecture, and of course I came across the Taj there as well, along with other miracles of the world. I vowed to myself that I would one day visit all these splendid buildings. Over the years I've been privileged to visit a number of these miracles already (e.g. the Sagrada Familia, the Alhambra, the Chinese Wall, Machu Picchu, the Aya Sofia). And in july of 2006 my long held dream finally came true: a visit to the Taj Mahal. Touching the white marble of the mausoleum truly was a moving experience for me, as can be seen in the video. I found out later that I was supposed to have left the video camera at the last gate, and that it was prohibited to film the Taj any closer than from the steps of that gate (before you enter the garden). Only nobody had told us (we had gone there early in the morning, so maybe the guards were still a bit sleepy). You are allowed to take pictures though, but only from the exterior of the Taj, no camera's allowed inside the mausoleum. I'm just greatful that they didn't confiscate the tape. 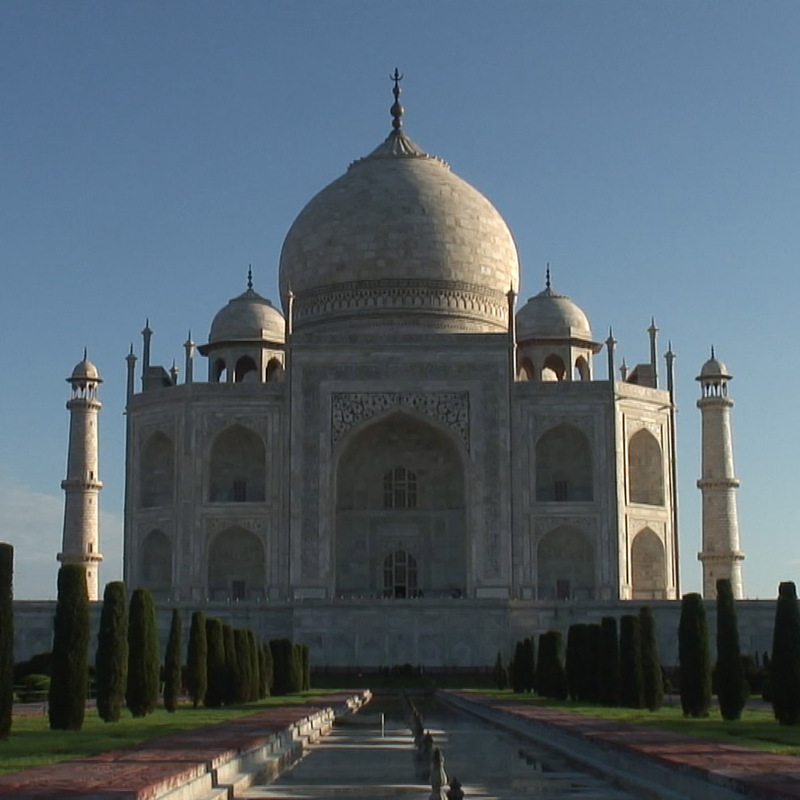 Because of its octogonal shape, topped with a dome, and all its marble surfaces, the Taj is in fact a huge echo chamber. If you're alone inside the mausoleum and keep perfectly quiet, you'll slowly hear the build-up of a humm, consisting of reflected noise that comes drifting in through the open doors of the anteroom. This humm I've never heard anywhere else in any other building. As I was prohibited to record anything inside the mausoleum, I've been forced to try to recreate it for this video with the help of my digital toys. All in all a unique experience (including the sunset that we witnessed from the other side of the river). More info on the Taj Mahal via Wikipedia. 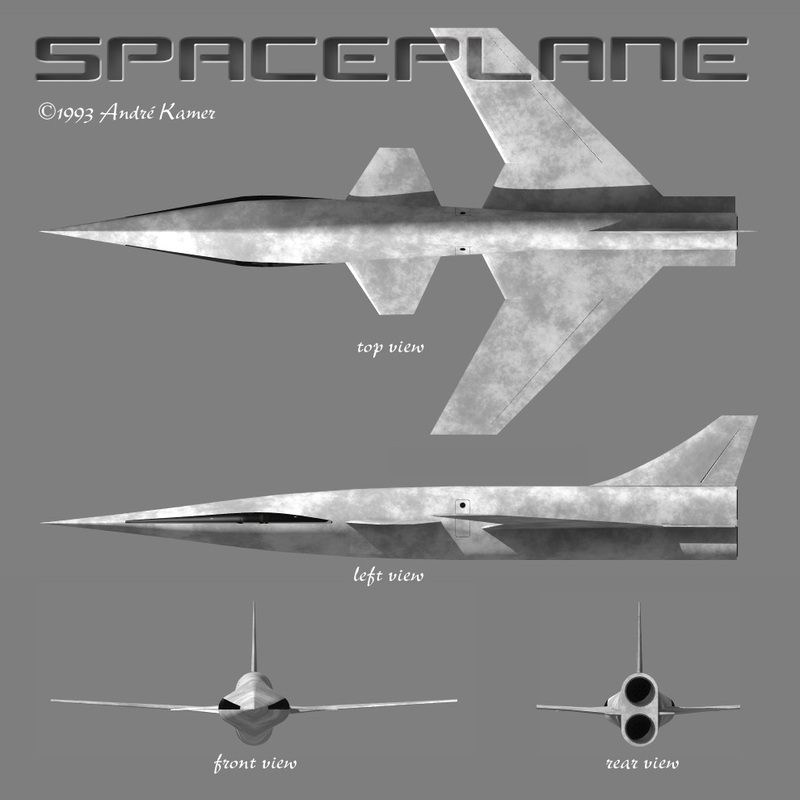 Brief: design a spaceship/aeroplane hybrid, to be used in a science fiction comic book. 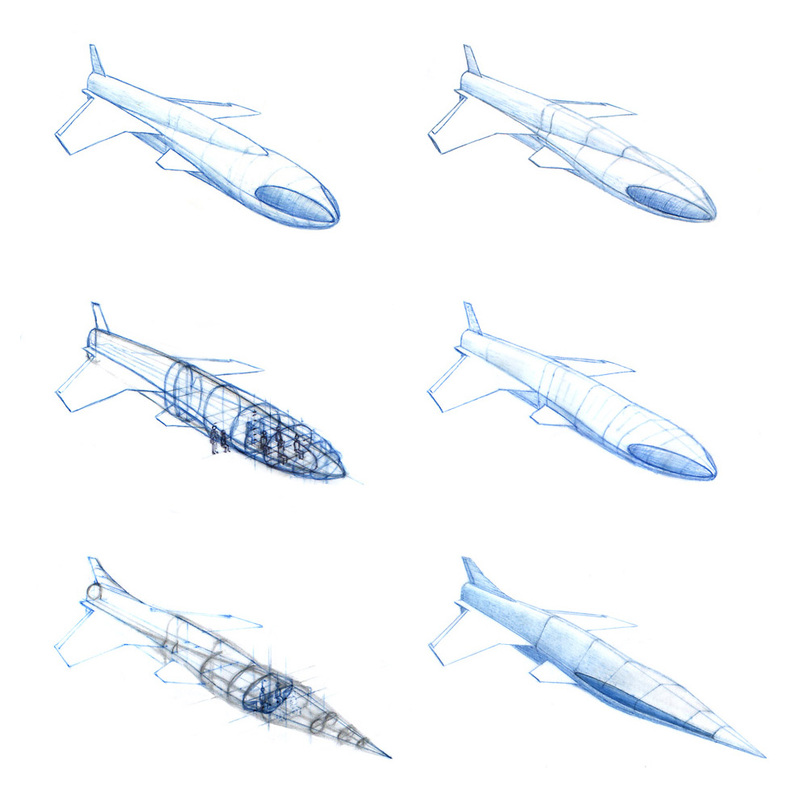 The first concepts for this Spaceplane were actually scetched on paper, in 1993. The design was improved upon after feedback from Alfons Mayer, who was studying Aerospace Technology at the TU-Delft at the time, and a 1:200 scale model was made out of cardboard and styrofoam. 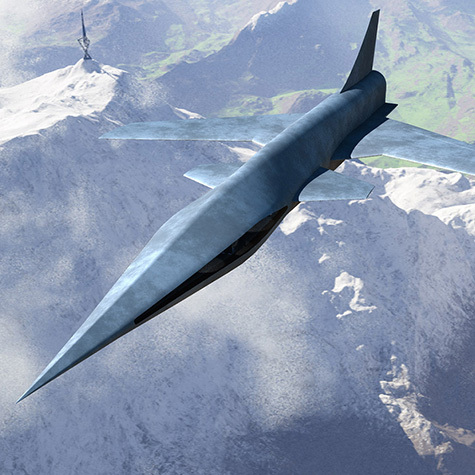 A first attempt to create a model in 3D-Studio, based on a series of cross sections, failed because of the technology available at the time. 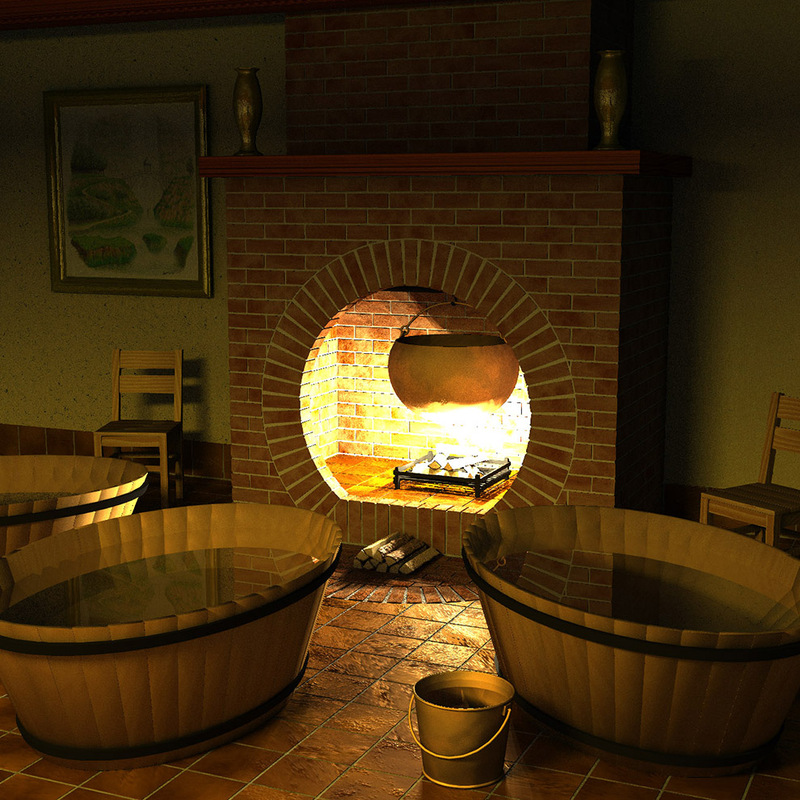 In 2010, the model shown here was constructed in Lightwave 9, based on the exact same cross sections. 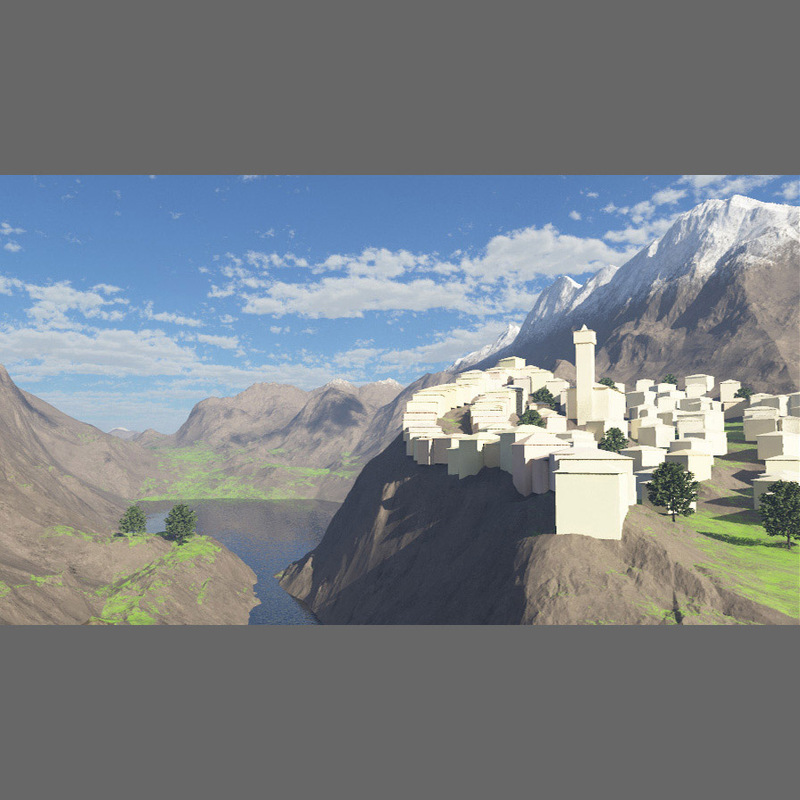 The landscape was created and rendered in Terragen. 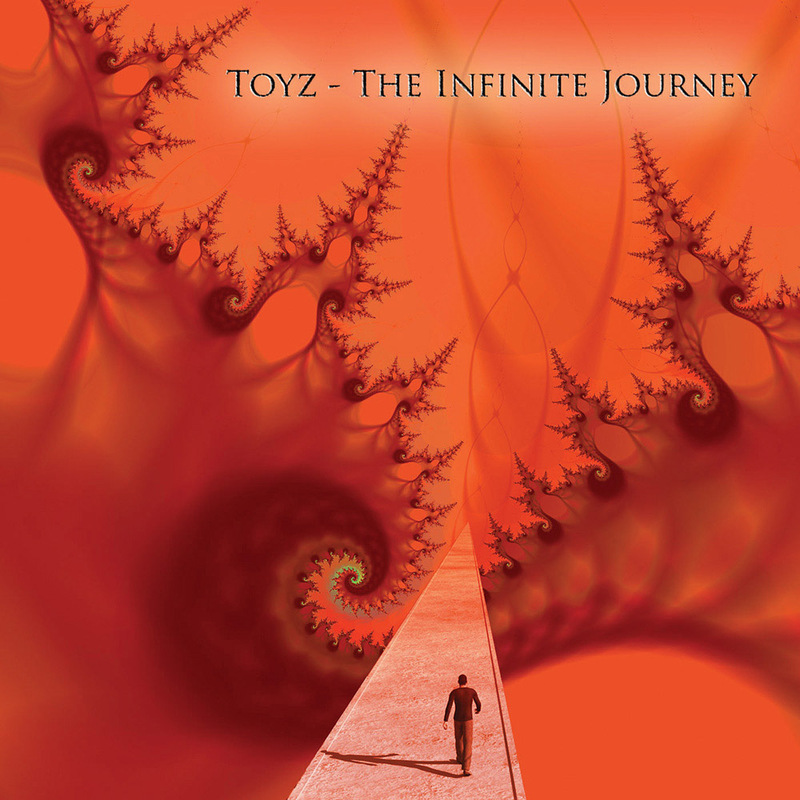 At the first meeting with the band, the concept of "the Infinite Journey" arose, symbolised by fractals, the infinity symbol and the Möbius strip. Later on in the process the actual title of the CD was changed to "The Infinite Road". 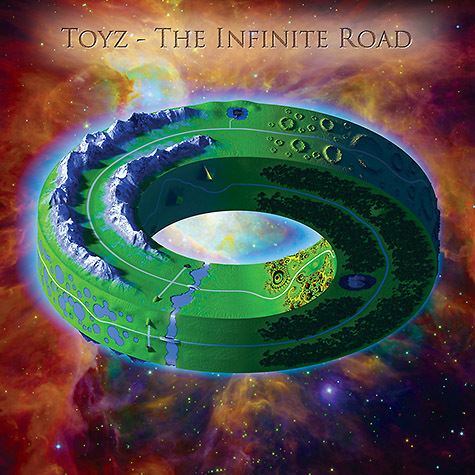 From five concepts for "the Infinite Journey", the band decided on the Escher inspired idea of a Möbius ring world, provided it would be surfaced with realistic landscapes. 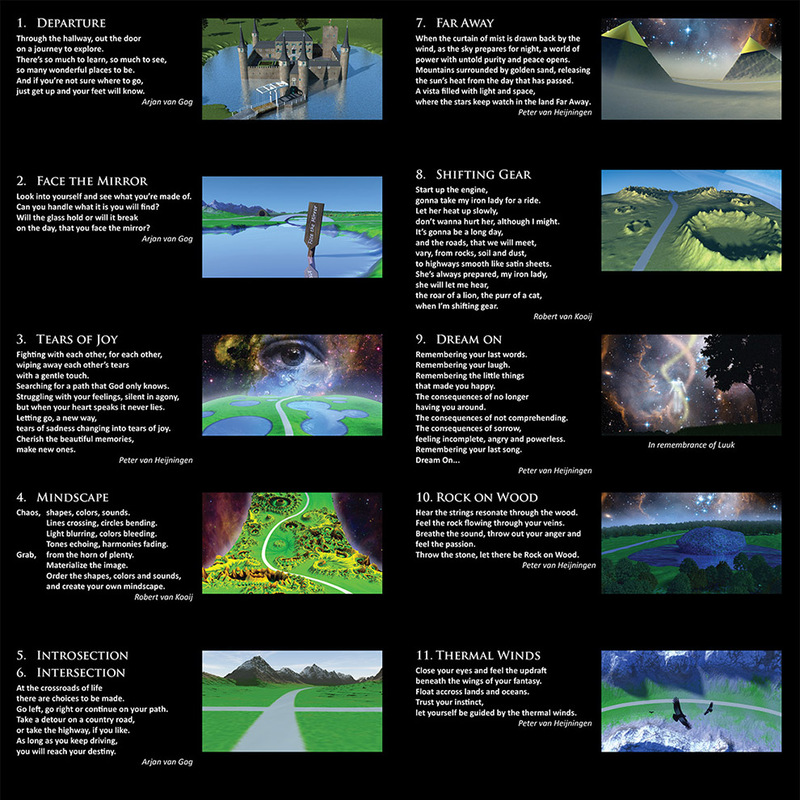 That in turn lead to the idea to link each track of the CD to a specific location on the ring and to create an image of that location for utilisation in the CD-booklet. 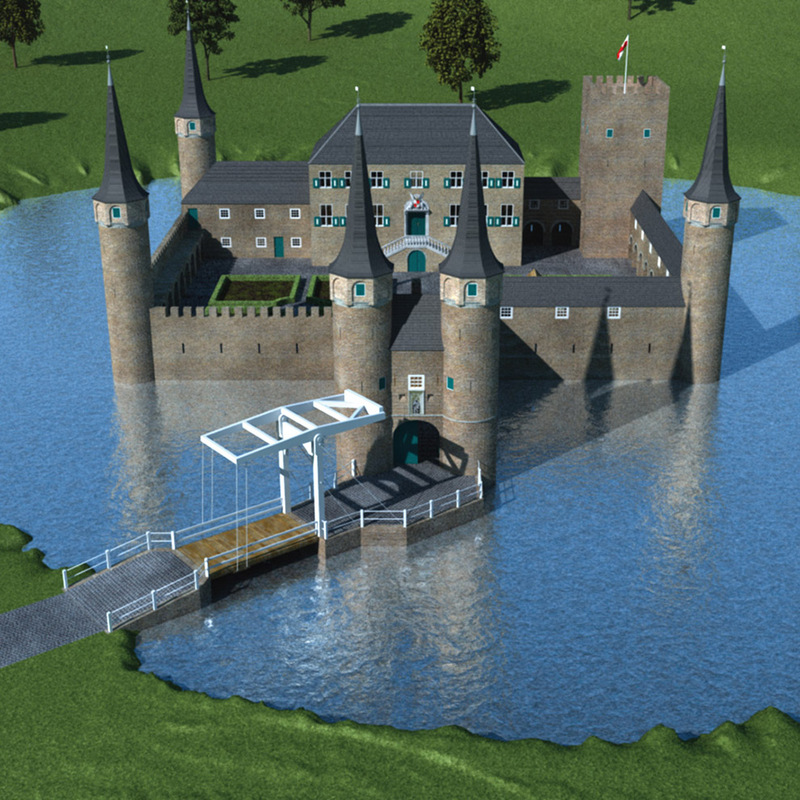 The ring world was modeled in 3D (in Lightwave and Terragen) and for the song Departure an entire castle was constructed, based on the Oostpoort in Delft. 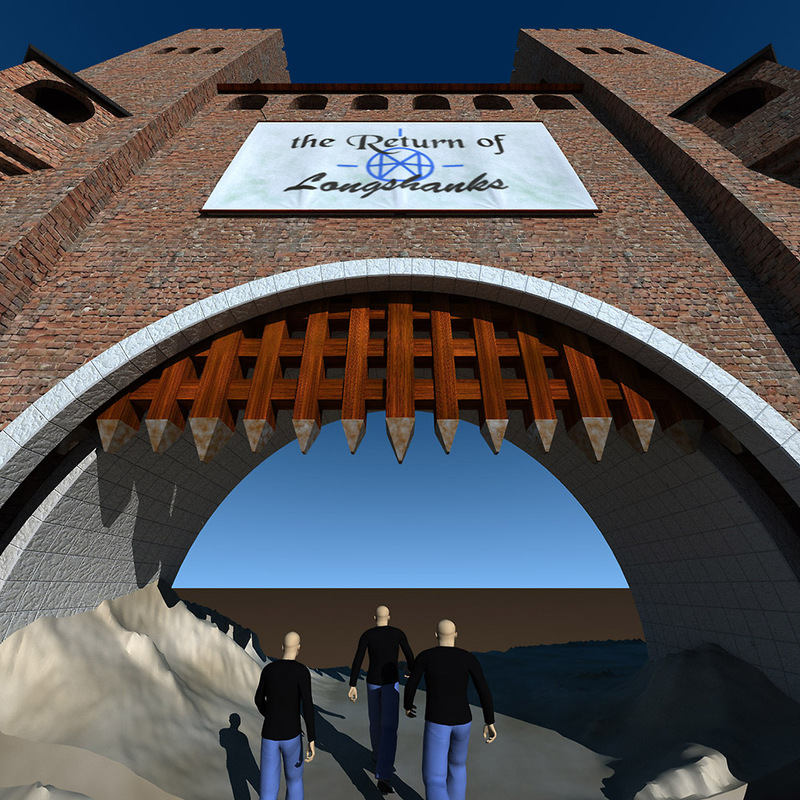 That castle was later used to create an intro video for the live performance of Departure. It was an unexpected bonus on our holiday in Peru (September 2002), after visiting the Nazca Lines and before going to Machu Pichu. We had embarked on a two day roundtrip by minibus from Arequipa to Chivay, which took us by gravel roads over the Andean Altiplano to a height of 4800 m., before descending into the spectacular landscape of the Colca Canyon. In the early morning of the second day we left Chivay for a 60 Km drive to a panoramic viewpoint called the "Cruz del Cóndor". With the canyon floor 1200 m. below us and a mountain peek towering 2000 m. above us on the opposite side of the canyon, the landscape was truely overpowering. 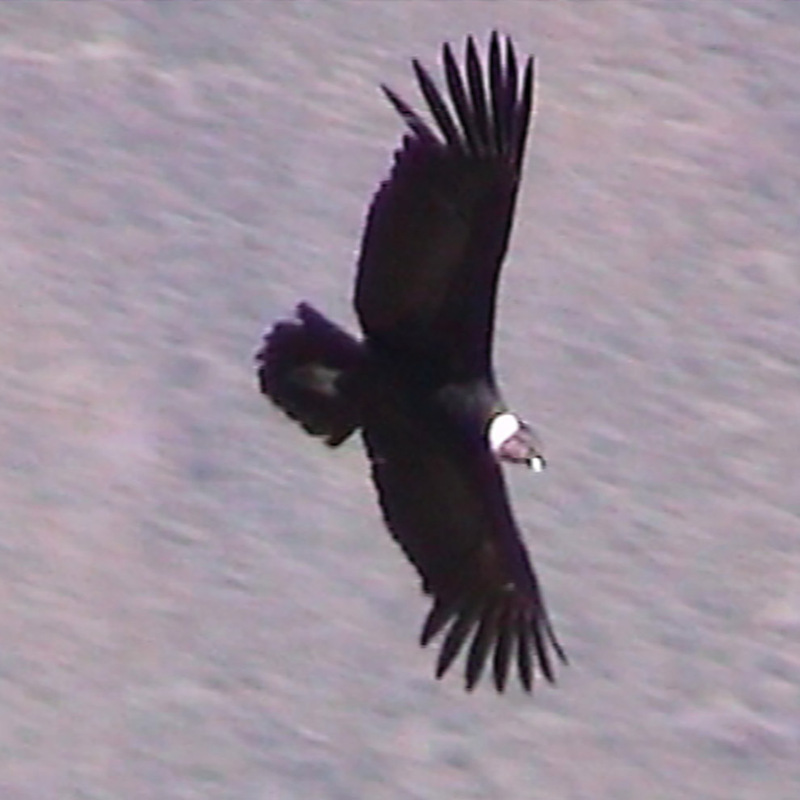 When we arrived there (at 8:00 a.m.) there was some condor activity in the lower parts of the canyon. We saw two parents (black/blue & white feathers) and a yearling (brown feathers) out of a population of some 10 birds. But after some 20 minutes they disappeared from sight. Another 20 minutes later, just when we were about to give up hope, they reappeared. By that time the sun had reached deeper down into the canyon and thermal currents had grown stronger, so in no time at all the same 3 birds were soaring right over our heads. Especially he yearling came in really close! At 9:00 a.m. sadly it was time to say goodbye to the condors and climb on the bus again for the hellish ride back to Arequipa. The entire trip back I was daydreaming on how I would combine the footage I shot with the Peruvian traditional "El Cóndor Pasa": the verses in the style of Pink Floyd's "One of these days" (for the birds in solo flight) and the choruses in the style of Brian May's wall-to-wall guitar duets, (for the synchronised flight of two or three birds). The video clip presented here was exactly what I had in mind then, on those infernal gravel roads on the barren high planes of the Andes. 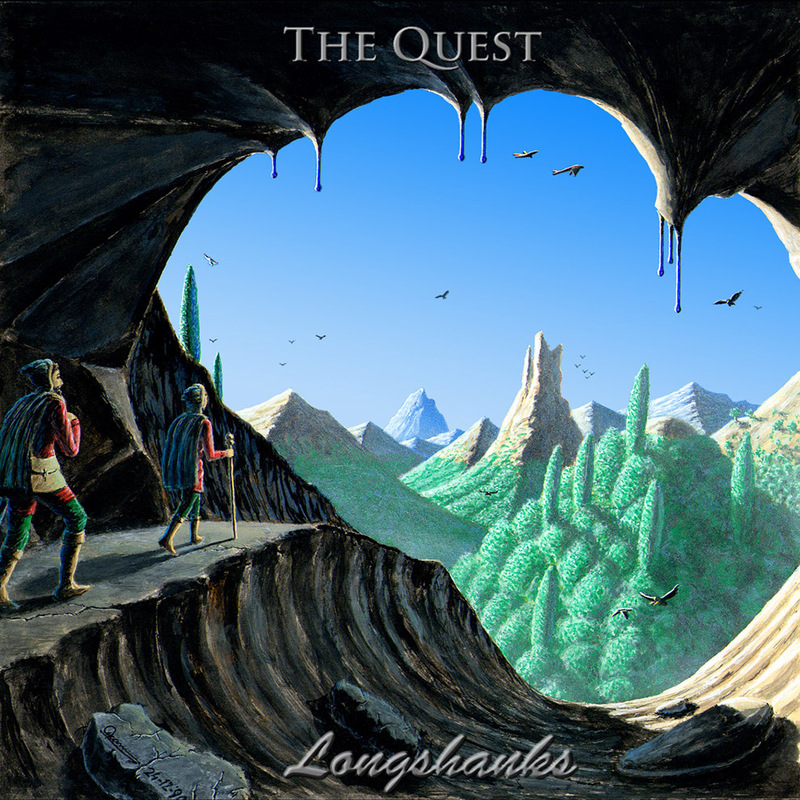 As the cover of "The Quest" depicts the stories protagonists setting out on their quest, the cover of T.R.o.L. shows their return to the gate of their home town. The first concepts for this illustration were scetched in pencil on paper in 2009. 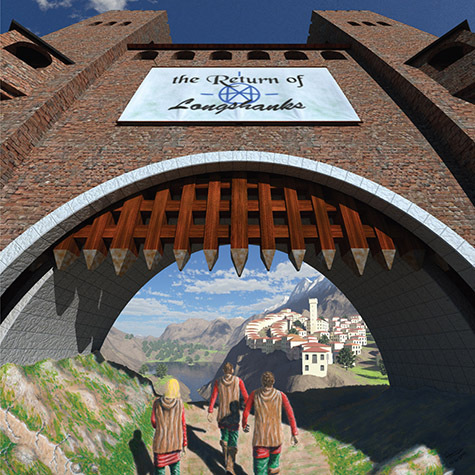 From those scetches the city gate was modeled in Lightwave and the landscape with the little town in Terragen. 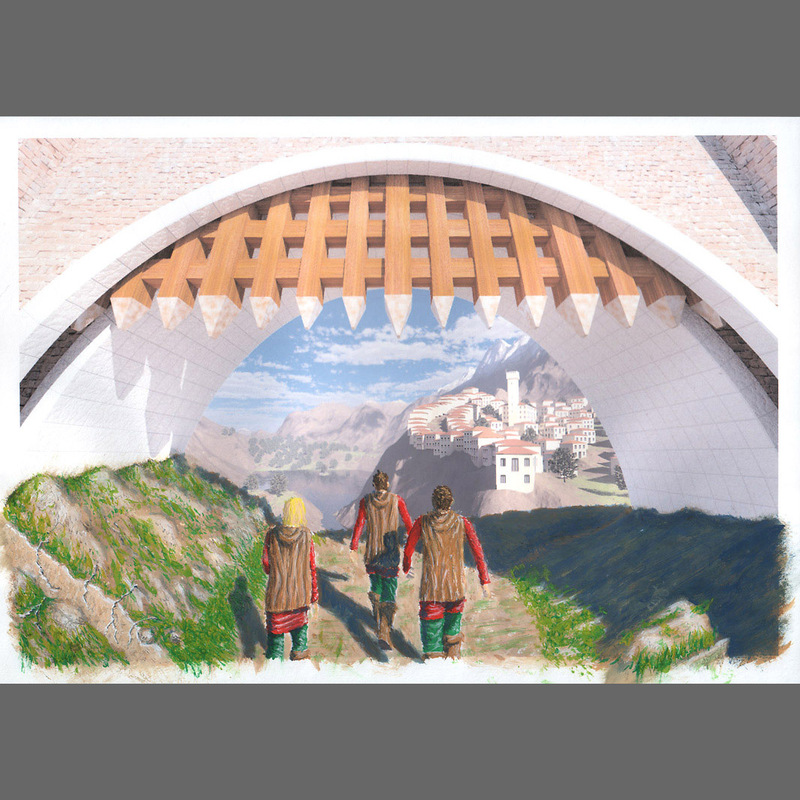 The three travelers were painted in guache on paper, which was then scanned. Finally all image parts were composited and finished in Photoshop. 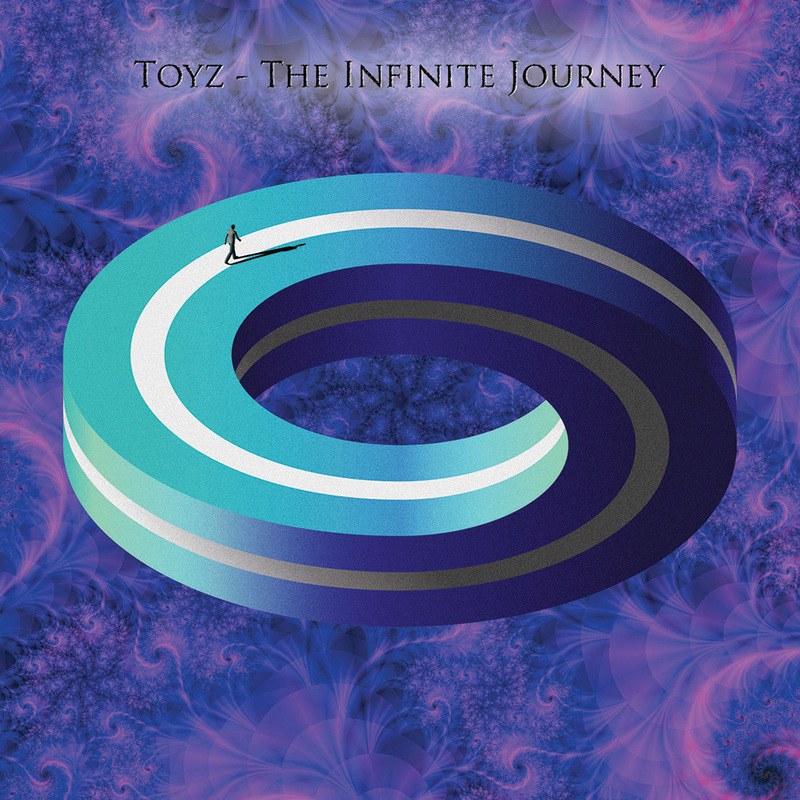 During the process of recording the album, each track was released separately on the Longshanks website, where a page was constructed for each song, containing not only an mp3, but also the lyrics plus a piece of artwork and some info on how the song had come into existance. One of the songs was the Bath Song, which took its lyrics from a scene in J.R.R. Tolkiens "The Fellowship of the Ring", where he has Peregrin (Pippin) Took singing on the joys of a hot bath at the end of a long day of travelling. The illustration shown with this song is a 3D modeling project, done in Lightwave: it was inspired by the painting "Bathing at Crickhollow" by Ted Nasmith. 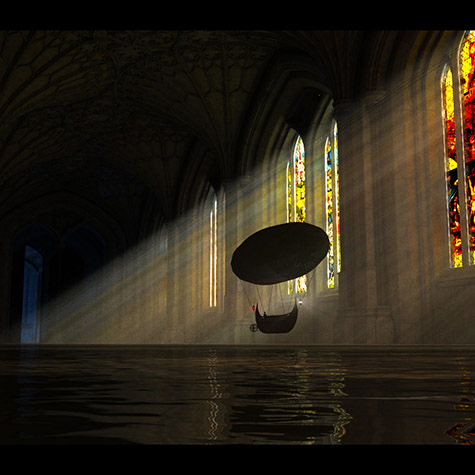 This image is an elaboration of a concept sketch for a part of the intro story of "the Cathedral of the Giants". In the introduction scene of the Cathedral of the Giants animation, the narrator talks about the rumours of remnants of a lost civilisation hidden in the Forbidden Forest and about adventurous youngsters setting out to find them (never to return). 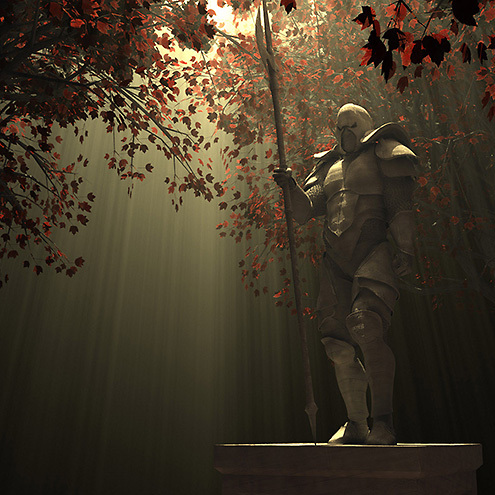 This is one of the remnants they would have encountered in the forest: a statue of a warrior, guarding the entrance path to the lost ancient city. In the end I chose not to incorporate this scene into the actual animation, but to limit the introduction scene to the manor room animation and have the narrator sketch out the setting for the story in words. 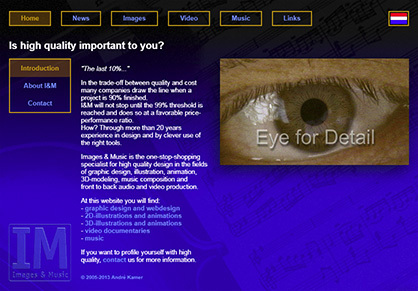 Visit the previous website of I&M. Even though I am a one-man production crew, I can't do everything myself all of the time. So I have a team, that consists of both physical and digital people. My cast of digital actors now numbers more than 200 characters and it will continue to grow every year. Meet some of my actors. 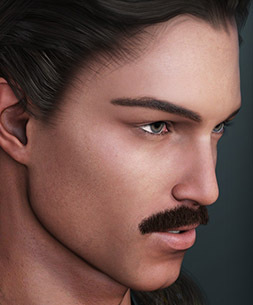 Alfred is a character for Michael 6 (Genesis 2 Male), developed by Fisty & Darc and Fred Winkler Art. 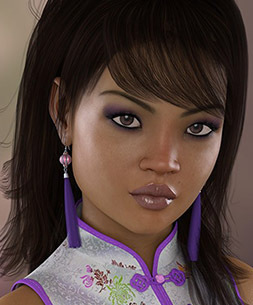 Xin-Quian is a character for Victoria 7 (Genesis 3 Female), developed by Sabby and Fred Winkler Art. 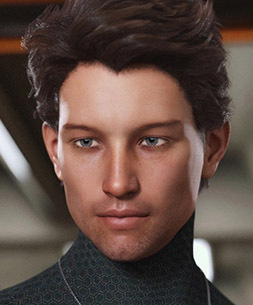 Neo is a character for David 5 (Genesis Male), developed by Daz Originals. Nathalie is a character for Olympia 7 (Genesis 3 Female), developed by Daz Originals, DemonicaEvilius and Silver. Ayunia is a character for Genesis 3 Female, developed by Digital Touch. 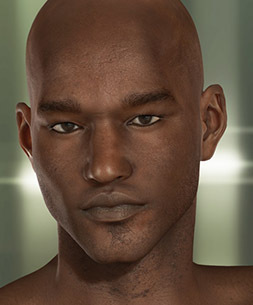 Sebastian is a character for Michael 6 (Genesis 2 Male), developed by Fred Winkler Art. 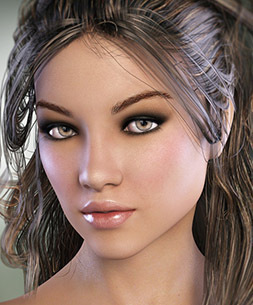 Elle is a character for Victoria 6 (Genesis 2 Female), developed by DemonicaEvilius and Silver. 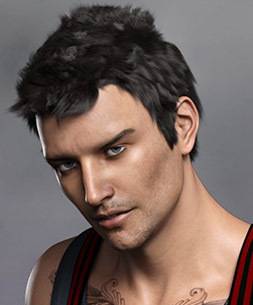 Liam is a character for Michael 7 (Genesis 3 Male), developed by Fred Winkler Art and Sabby. 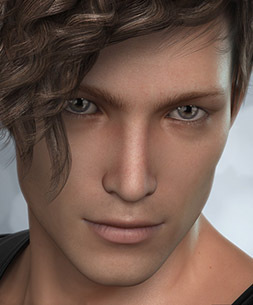 Sean is a character for David 5 (Genesis Male), developed by Daz Originals. Ginnifer is a character for Victoria 7 (Genesis 3 Female), developed by Fisty & Darc, Fred Winkler Art and Sabby. 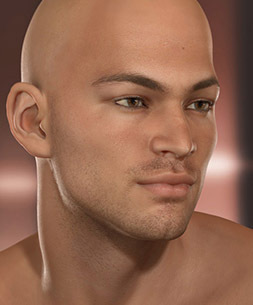 Alex is a character for Michael 7 (Genesis 3 Male), developed by Daz Originals, Fisty & Darc and Fred Winkler Art. 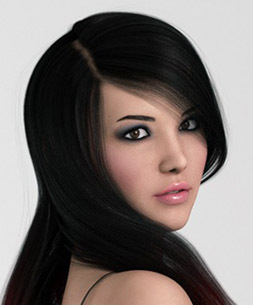 Sydney is a character for Victoria 7 (Genesis 3 Female), developed by vyktohria. sometimes just a single image. be sure to contact me to find out how you can benefit from my skills and experience in creating beautiful Images and Music. Please use the contact form for sending me your questions. I can of course also be reached by phone or by analog mail.